One of my goals for 2018 is to sew more, and another is to become more involved in our new community. Combining these goals led me to attend a local quilt guild meeting. After months of having conflicts with the meeting dates, it worked out well that my first meeting was in January; there were at least four other women who were also there for the first time. There’s comfort in not being the only new face. Everyone was friendly and welcoming, and the guild maintains a full schedule of events throughout the year. 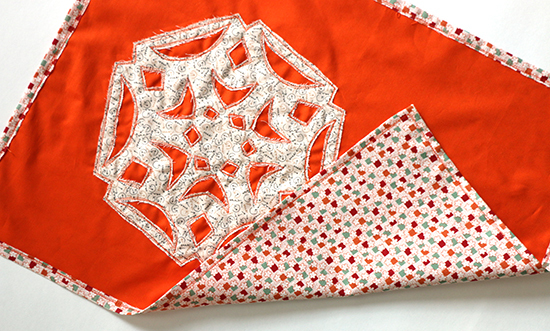 It will be easy to jump right in and start quilting again. I have three guild events on my calendar already for February! For the January program, I was excited to learn about the new-to-me technique of sketch stitch machine applique. We started a small project at the meeting, to be completed at home later. Each of us started with a 10-inch (25.4 cm) square piece of fabric and a fat quarter. We folded our fabric squares to cut into snowflakes, just as you would for paper snowflakes. At home, I fused interfacing onto the back of my fat quarter. I dabbed a few areas of the snowflake with a glue stick before setting it in place for sewing. 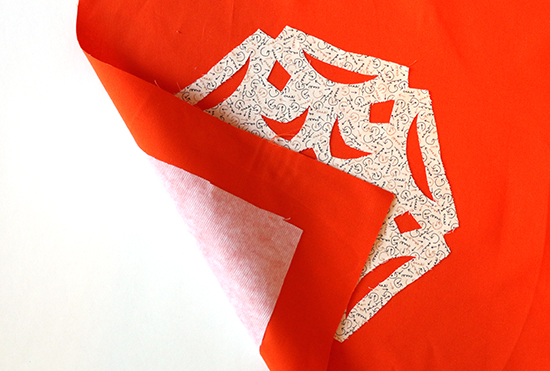 Sketch stitch is a fun way to applique. I sewed around each fabric edge three times, and for once the goal was NOT to neatly follow a certain line. The stitching is supposed to look a little messy. I discovered that I had to put a little effort into changing up my sewing lines for straight areas, but I had no problem going all over the place on the curves. Let’s not think too hard on what that says about the current state of my sewing skills. The fat quarter could have been cut to any size, to suit any number of projects. The guild’s ongoing philanthropy project happens to be place mats — they donate place mats to charities that provide meals for those in need, to be distributed during the winter holiday season. With that in mind, I set about making a place mat for the first time. With another fat quarter for backing, I started measuring and planning how I was going to finish the edges once I had sandwiched the pieces together. Then I realized that I was making it too difficult — why not follow the same technique I had used for the applique? I squared up both fat quarters, making the backing fabric about a half inch (1.27 cm) larger than the front on all sides. I folded and pressed the edges then sewed them down with more sketch stitch, leaving the raw edges exposed just as they are on the snowflake. I’m on my way to meeting two of my goals for 2018, I’ve made a new type of project using a new technique, and I've finished my first donation piece of the year. Not a bad start! 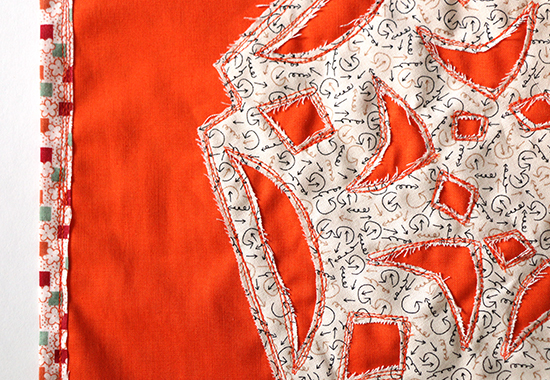 Have you appliqued with sketch stitch? How do you like it? That looks like fun! I may have to give sketch stitching a try! I've used that technique a time or two, but it's not my favorite method. 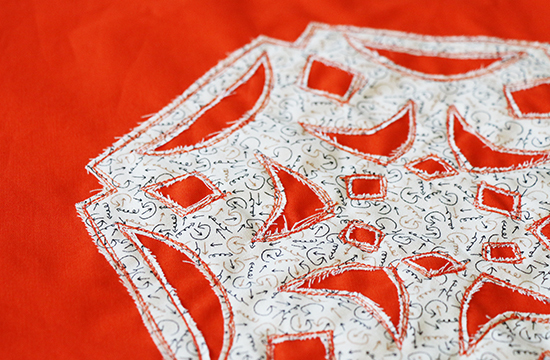 Fortunately, there is more than one way to applique. Looks like you really made it work for you!! Yeah, it's not going to be my new favorite method but it's a fun way to change things up! I was always fascinated with other people's sewing skills - tried myself several times, but it never grew on me... Love this technique you're showing, it must open so many design possibilities! Every new technique leads to so many more possibilities!